UHaul rental "addition" to the SYD tent setup! 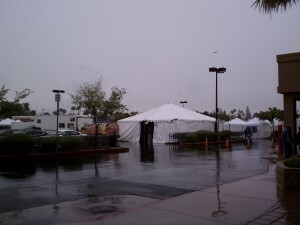 It was cold, wet, and windy at the first Sams Club BBQ Series which kicked off nationwide in Gilbert, Arizona. Since it was so windy, Benny and I decided to rent a Uhaul truck to get out of the wind. 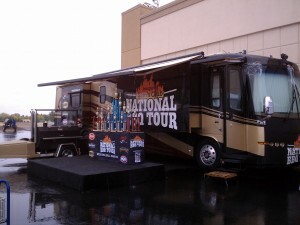 Lucky for us, the Uhaul rental place was just across the street from the Sams Club where the contest was being held. At $19.95 it was a great way to cook while sheltered from the elements. When the other EZUp equipped teams learned what we did, they made a bee-line for the rental also. By nightfall Friday, there were 3-4 Uhaul trailers dotting the parking lot as other teams also took insurance policy refuge against the inclement weather. Warm and cosy away from the wind and rain! We finally got to meet Lance Rosen, a fellow Q-er from Down Under in Aussieland. We had been exchanging emails with Lance who owned a grill restaurant in Melbourne the past 5 years and wanted to convert it to an American BBQ joint. 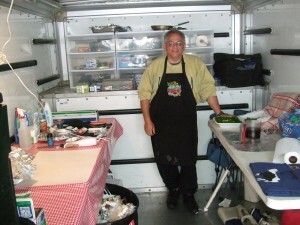 He was touring the US to take BBQ classes, meet fellow pitmasters, and eat BBQ around the country. 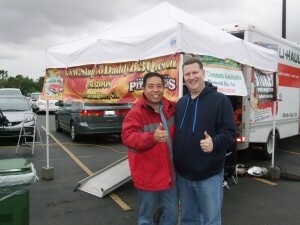 We introduced him to our fellow pitmasters who attended this event and Lance took plenty of notes and tips. 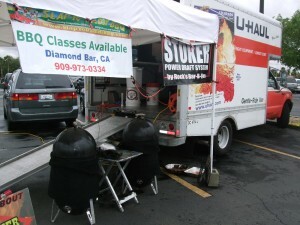 We finished 4th overall amid 30 teams with 1st Brisket, 5th Pork, 11th Chicken, and 20th Ribs. 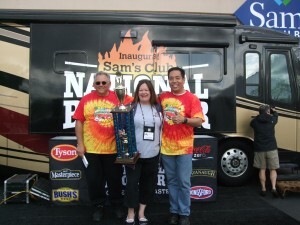 Congrats to Iowa’s Smokey D’s for GC and Jennifer Duncan of Smoked To The Bone for RC. Congrats to all who walked. It was a challenging field and a great contest. 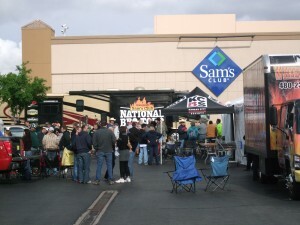 Thanks to KCBS officials, KCBS Staff, and Sams Club for this event. What do you think about our new fashion trend setting SYD team shirts. We predict that tie dye and florescent colors will be the rage in 3-6 months. Remember you saw it here first!